Payment is made at the time of delivery to the delivery driver. Cash, Check, or Credit Card (or Paypal) is accepted. The amount and location of deliveries changes daily so look for you invoice email around 10:00 AM for an updated time estimate, on the day of delivery. We try to give a 1 hour estimated arrival window (not guaranteed). Note: We load in Roseburg at 8:00 AM, so no need to hang around your house in the AM hours...especially you Brookings people. Fully Insured Delivery Service. No payments required until delivery, and no charge for missing or incorrect products. (See return policy). Transparent Automatic Cost Structure. You always get a copy of your Original Costco Receipt. Costco membership is NOT required to get delivery from us. This can potentially save you $75 - $110 per year in membership fees alone. I. 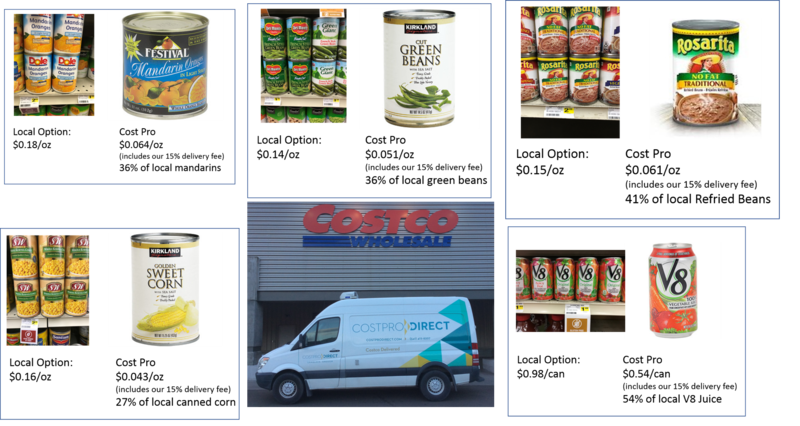 We track nearly 3,000 Costco items manually so price changes can sneak up on us. That's why we will always have the Costco Receipt available for you so you can see what was charged by Costco. Sometimes we are giving new products without price info. If you see a price of $1 for an item it is probably in stock, we just have not tracked down the price, yet (calling Costco is the best bet). II. DON'T SEE IT IN OUR CATALOG? Click on Product Request and get it delivered. Costco does not share their Inventory Files with us - so we ask our customers call the Roseburg Costco Directly. Phone number and procedures are in the Product Request Link (541-378-0020 ext 1). If the Roseburg Costco has it, Cost Pro Direct can deliver it to you! *Audit plans available for large, unusual, high dollar, or tobacco deliveries. Cost Pro Direct formed August 2012 after Eugene Costco Business Delivery concluded 15 years of coastal delivery service. Modeled after Eugene Costco’s $35 per stop business delivery, Cost Pro Direct has worked hard to keep prices low while continuing weekly service sourced from the Roseburg Costco. 14 Jun 2016 we started working out of the Medford Costco after the Roseburg Costco ended their fax and pull program after a 4 year run.....but then we went back to Roseburg 3 months later when they decided to start their fax and pull program again. We look forward to speaking with you and hope that this service will be a benefit to you, your family, or business. costprodirect.com is a ruralgoods.com website.